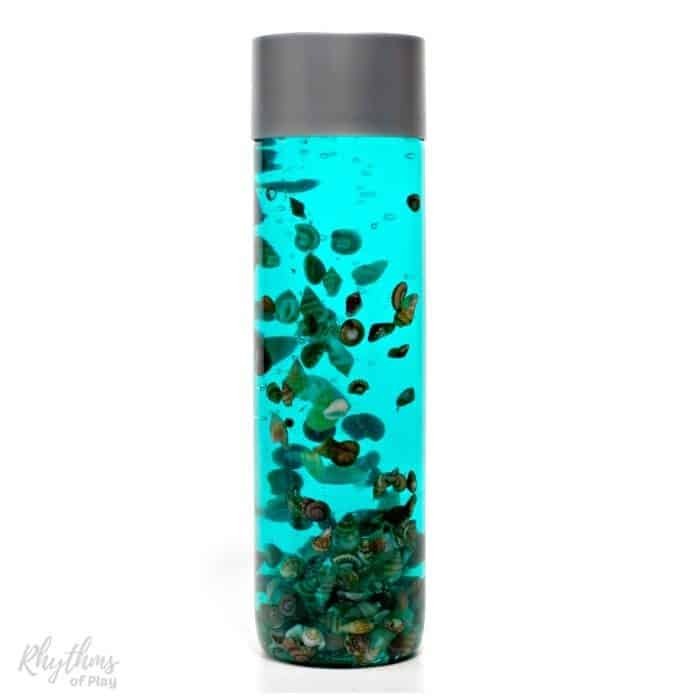 This calming DIY Sea shells sensory bottle can help children (and adults) learn to self-regulate. The gentle motion of the falling seashells can relieve anxiety as the shells slowly swirl and float around in the bottle. Make your own soothing sea shells sensory bottle today! 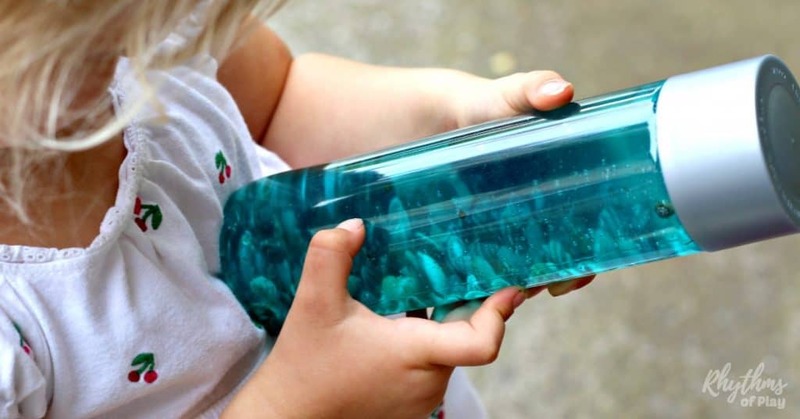 Sooth your children worries with this easy homemade sensory bottle. A seashell discovery bottles is also great for no mess safe sensory play. This soothing sea shell sensory bottle is a simple way to allow babies and toddlers to investigate shells without the risk of choking on them. For more information about sensory bottles and their uses check out Calm Down Sensory Bottles 101. Seashells (There is enough to make this bottle and a few of these shell flowers and/or shell handprint keepsakes. Blue food coloring or liquid watercolor paint. Grab a bottle from the recycle bin. Clean the recycled bottle and peel off sticker. Use Goo Gone if you need to remove sticky residue. 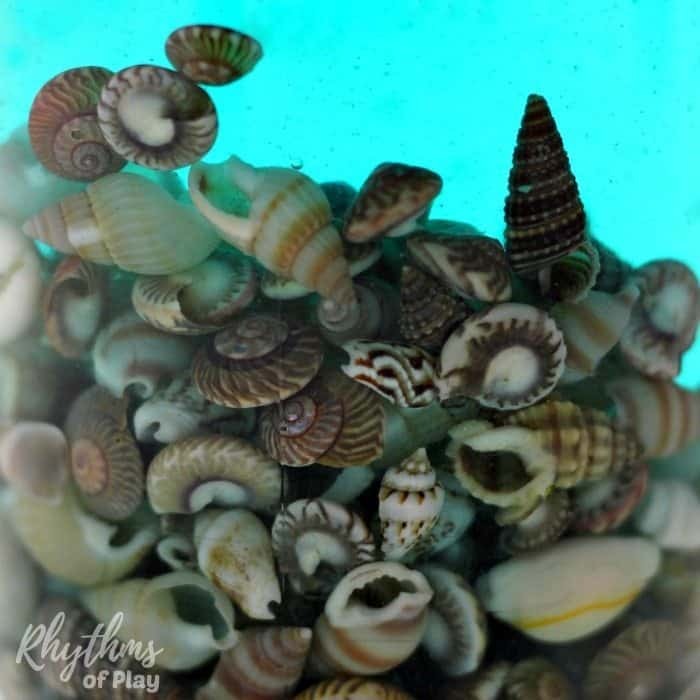 Clean, soak and rinse 1/3 – 1/2 cup of seashells so there are no broken shell pieces or other particles remaining. Dirty shells make dirty sensory bottles! 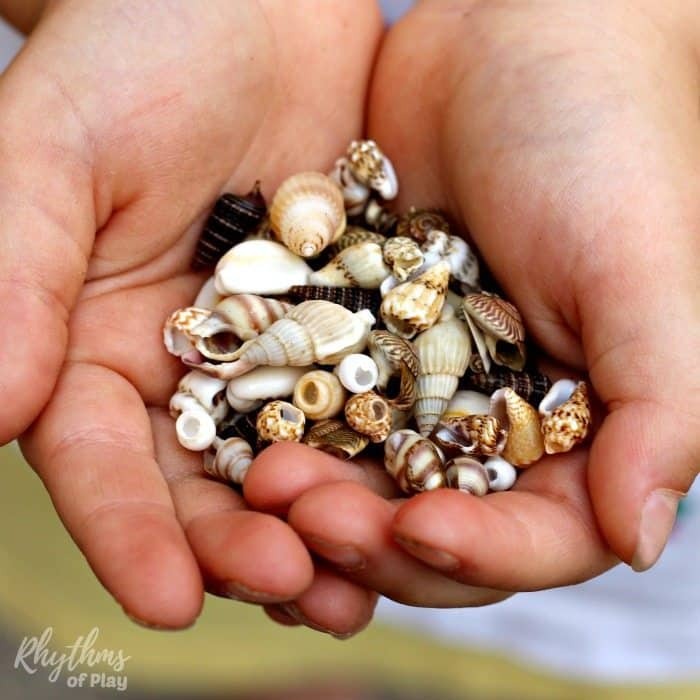 Place seashells into the recycled bottle to create your soothing sea shell discovery bottle. Pour 1/4 – 1/2 cup of tap water into the bottle. Place a couple drops of blue food coloring or liquid watercolor into the bottle and give it a gentle shake. Fill the bottle most of the way up with clear liquid hand soap . Leave a bit of room in it until you see if you like how fast the shells move. Check out our tips in the next section! Place the lid on your soothing sea shell sensory bottle and shake it up. It will be a bit murky for a few hours until the contents mix and settle. Play with your seashells sensory bottle for a day or two to make sure you like the way it moves. If you want the shells to move a little faster add a bit more water. If you want them to move slower add a little more clear liquid hand soap. When you are happy with the way your shell calm down jar moves, fill it all the way up with water or liquid hand soap so there is no air in it. Sensory bottles like this slow falling sea shells sensory bottle can be used to help soothe a child when they feel overwhelmed. Even an anxious adult can benefit from the soothing quality of this seashell sensory bottle. Discovery bottles are also great for no mess safe sensory play. They are the perfect way for babies and toddlers to safely investigate small objects like shells without the risk of choking on them. For more information about sensory bottles, their uses, how to make them, and troubleshooting tips check out Calm Down Sensory Bottles 101. Why did you use hand soap in this instead of glue? I’m thinking of doing this activity at a party that is only 3 hours long, so I don’t want this beautiful craft to be murky during the party. Can you mix the water and soap ahead of time for 10 children and then let them pour the mixture into their bottles all at once? In my mind’s eye, it sounds possible. Just make sure you fill each bottle up to the top before you put the cap on and it just might work. Let me know how it goes!